Here is super simple idea for an anniversary (or birthday or mother's day etc.) card using an inexpensive mini album often found in a craft store clearance bin. The album has a dark green cloth cover and a plastic protective cover that can be easily removed and replaced. I found some travel printed card stock and adhered it to the album front with Merikan tape (from Ben Franklin Crafts), leaving the right edge of the smaller piece untaped. 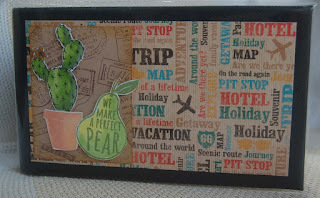 Next, I stamped, colored (with Copic pens) and fussy cut the pear with words, cactus, and clay pot. All three pieces were positioned with foam dots. 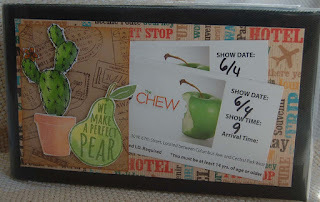 To show you the versatility of having a pocket in the album cover, I placed my used Chew show tickets in it. (Yes, we attended a taping in N.Y. and I was even introduced on the show for an idea I submitted, plus we won two $75 Target gift cards....woot woot!) I actually plan to put some of our plane tickets in the pocket or perhaps a photo of us...not one of our goofy selfies! Within the album I am going to put the assorted selfies and food photos we have taken while traveling. I think it is hilarious to see them all together and eating is almost the only time we remember to take out our camera or cell phone and snap a moment of our lives. The cactus and pot are from the Hero Arts stamp set I featured in my last post. While trying to come up with a different anniversary card I was struck by the funny bug and 'paired' together the pear image with the cactus pear image. I admit it; I am the prickly pear cactus and my husband is 'usually' the sweet pear! I hope that this post has given you an idea of how you can make an album card too. It's a good way to send a greeting and collect together favorite photos and memorabilia. Happy Album/Card Crafting ! 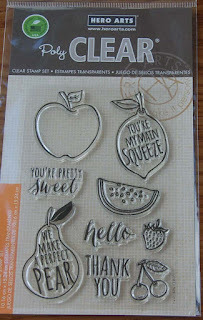 I had my newly purchased (from HM Ben Franklin Crafts) Hero Arts stamp sets laying out on my desk when a funny card popped into my ridiculous brain. It was simple work to attach (with foam dots )the stamped, colored, fussy cut images. 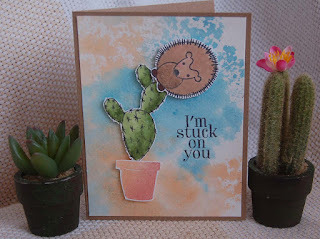 I used Momento pens for the cactus and porcupine but applied ink pads to color the flower pot. The background was made by pressing damp watercolor paper to a slick surface that was dabbed with Ranger Distress orange and blue ink. With an appropriate sentiment inside, this card might make a great Valentine's Day card. 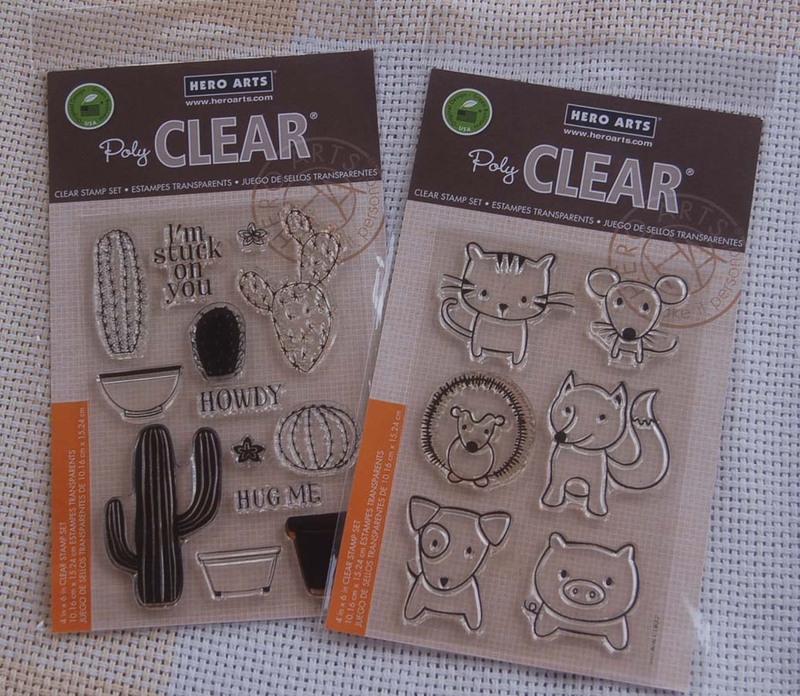 Because of the simple lines, the animal set is easy to color and cut out....great for kid card crafting. The cactus set is very versatile because it comes with several cacti and flowers along with cute words and planter pots. I was able to cover up a coloring boo-boo on the porcupine with brown Fun Flock (Stampendous) that adds some nice texture....shh-h-h it'll be our secret fix-it tip! Here is a closer look at the 'fake' WHATTTT???? 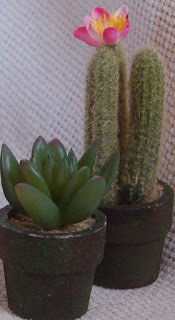 cacti and succulent from BFC. They have some realistic looking potted artificial plants which will give hope to black thumbed gardeners like me....yes, I even kill cactus! 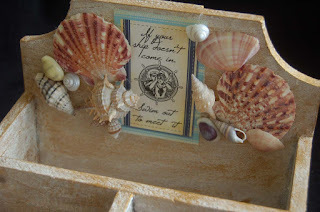 Shop at HM Ben Franklin Crafts....you never know what beautiful items you'll discover there. 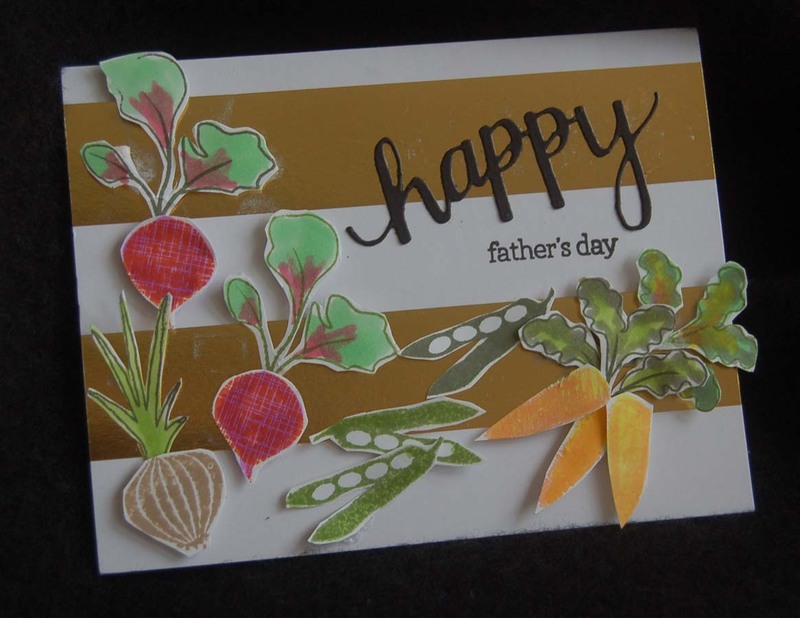 This might seem to be a weird Father's Day card, but my husband has two non-work activities, golf (at the driving range, mostly) and gardening. 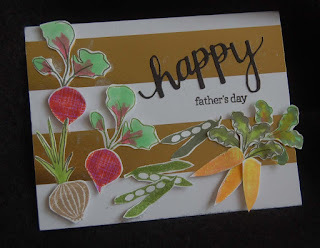 Of the two, gardening is the most productive so I decided to feature the veggies on his card. Luckily, HM Ben Franklin Crafts just brought in a Hero Arts stamp set featuring vegetables and cute sayings. I stamped these out and colored them with Copic pens. 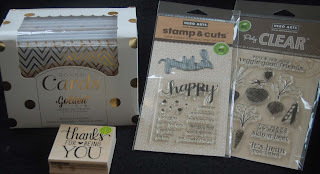 The 'happy' was die cut from black card stock using the die from the Hero Arts stamp and cuts set. This set also contained the father's day stamp. I think this is a very useful set because of the stamp words that go with the die. (I chose not to stamp the 'happy' word on the card because I didn't think it would print well on the slick gold surface.) For other cards the 'happy' can be stamped first and then die cut to give a different look. 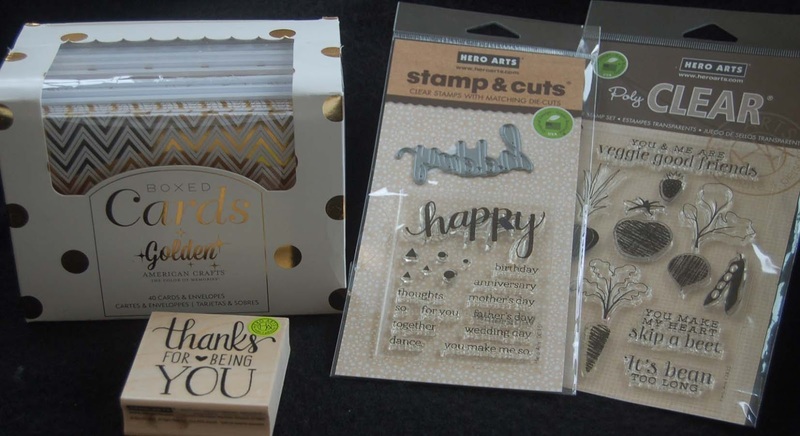 I love the elegance of the shiny print gold cards in the American Crafts boxed set that I purchased at Ben Franklin Crafts....so many awesome designs.....perfect for quick impressive cards! (Oh, I almost forgot: The wooden Hero Arts stamp in the photo below shows what I stamped inside the card.) 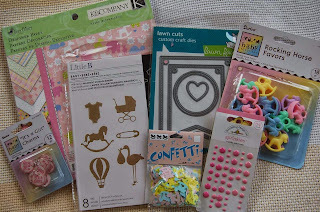 Okay, that's it for this post....hurry, time to go shopping for some crafting fun at BFC! This card started as a product testing project. I discovered some new Bo Bunny items at HM Ben Franklin Crafts, specifically sticky stencils and glitter paste. For the background, I used the star stencil with blue and silver glitter paste (the silver in the left-hand upper corner and the blue on the other side). This stenciling system with the sticky back is honestly the best I've ever used. It stays in place and lifts off easily...washes in a snap too! 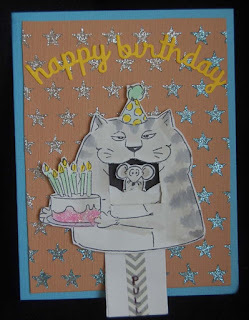 "May your birthday be as happy as the first cat who figures out how to work a can opener!" 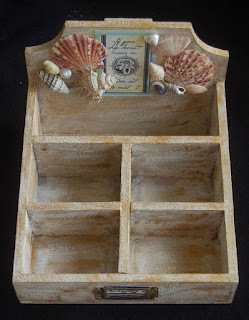 Recently I saw a beautiful project at HM Hilo Ben Franklin Crafts (made by one of the talented employees) and I knew that I had to make a similar one for our guest bathroom. 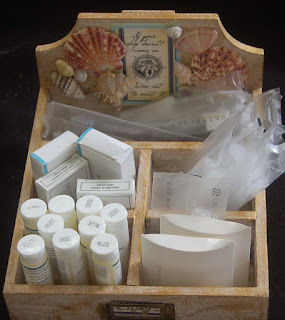 I started with a lightly white stained wooden box with a file cabinet label. 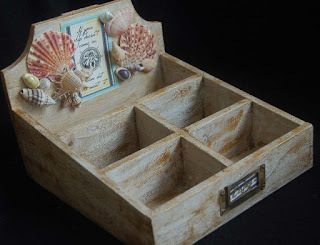 I wanted the box to look even more rustic so I painted it with Tim Holtz white crackle paint, let it dry, and then rubbed on some gold Viva paste paint. As you can see the box can hold an ample supply of personal supplies (shampoo, conditioner, tooth brushes, comb, wash cloths, etc. ) to make your guests feel welcome. Extra amenities from hotels will fit well here...LOL! To complete the look I added a variety of seashells also purchased at BFC. (There were so many beautiful ones it was hard to choose!) I also added a label I cut from a Canvas Corp 12x12 card stock sheet. I can't quite remember what the box at BFC looked like...I think it had a rope trim and was more nautical. Here is a close up of the crackle paint with the gold rubbed on. I really love the look especially because our guest bathroom has gold burnished fixtures. 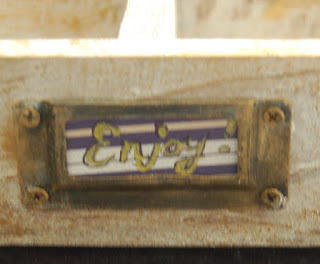 I couldn't find (but it's somewhere) my 'enjoy' stamp so I had to hand write the label. I'll change it later when I discover the stamp where it shouldn't be....hahaha! I think this is a nice way to greet your house guest who will certainly feel welcomed by this gesture of hospitality. 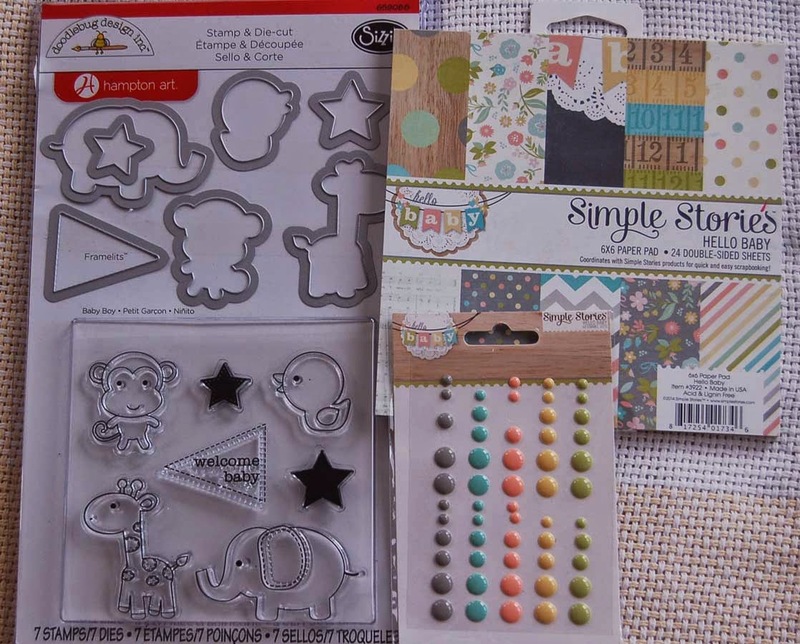 Be sure to check out HM Ben Franklin Crafts to find a huge assortment of undecorated wooden pieces....... awaiting your creativity! 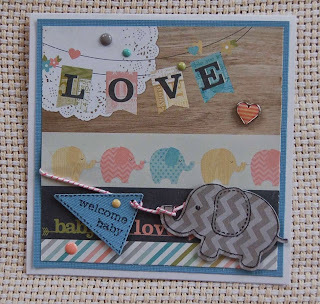 Initially, I wanted to make a boy version of my previously posted baby card, but I couldn't find just the right paper. Then, I remembered that I had a paper pad of Simple Stories 'hello Baby' that I planned to use in an album for a gift to the new parents. I had a 'light bulb' moment and decided to make a card to match the baby Simple Story album....I will complete it....I will! 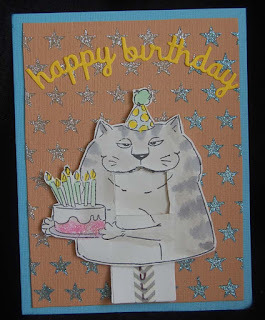 Anyway, because of the Sizzix/Doodlebug Designs stamp/die set, this card was whipped up in no time at all. The paper already looked pieced together and all I really added were the epoxy dots, twine, and a heart brad (with the fastener arms broken off). Voila, instant card! Okay, time to get going on that matching album....really! It's been a while since I needed a baby card so I wasn't sure how to start on this one. I looked in my 'baby supply box' and found an amazing amount of cute baby items collected over the years mostly from HM Ben Franklin Crafts. 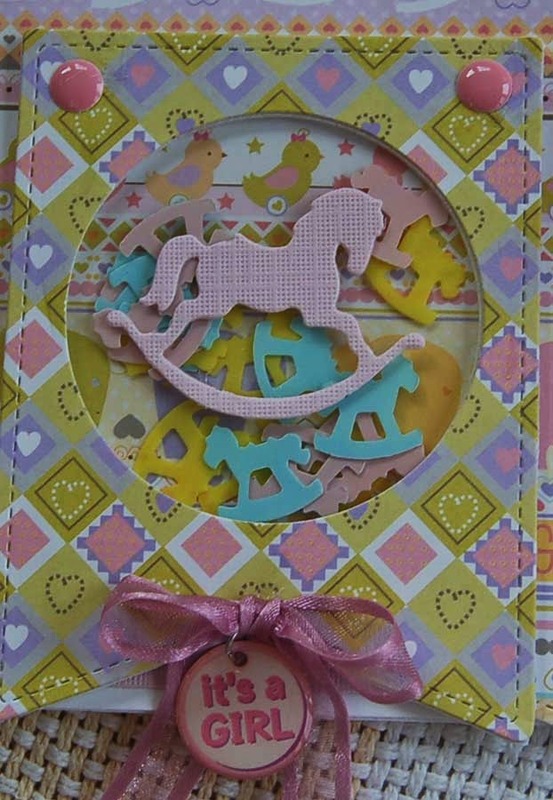 The girly paper came from a K and Co. pad and was the inspiration for the rocking horse theme. 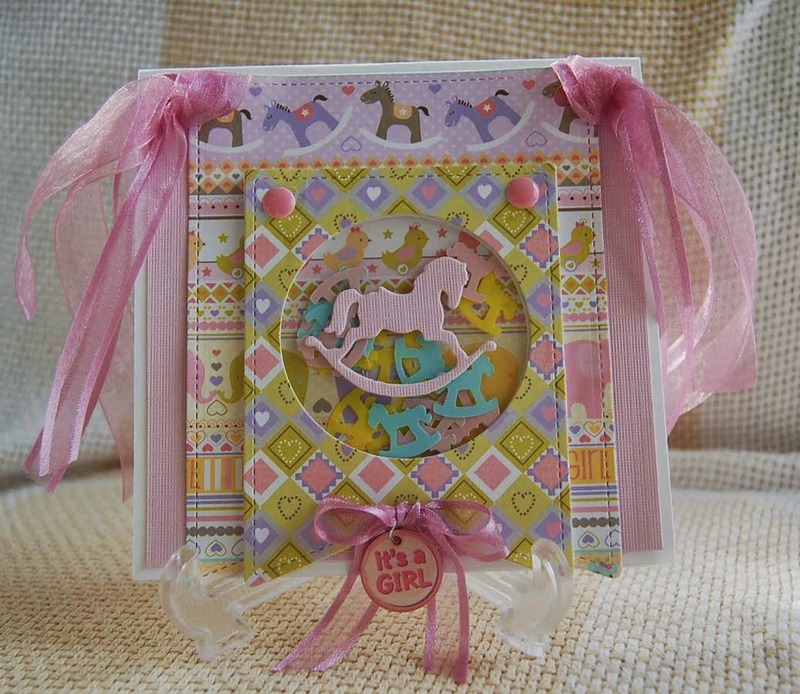 The Lawn Fawn banner and circle dies formed the base for the unusual card format. Because the banners had punched out holes for hanging, I decided to put gauzy ribbons in one set and epoxy dots in the other set. Here is a close-up of the shaker banner. By cutting a thin foam sheet banner and gluing it to the matching banner, I was easily able to create a recess for the rocking horse confetti which came from BFC (wedding/baby department) as did the 'It's a GIRL' charm. 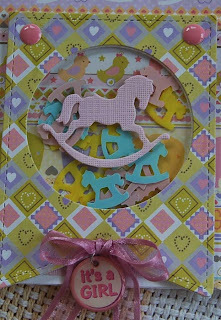 The Little B rocking horse die was perfect for cutting the piece that decorates the shaker window. 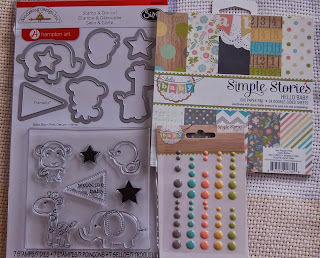 These are the supplies that I used on the Baby Girl card. Also included in the photo are some plastic rocking horse charms that I plan to tie onto the ribbon when I wrap the gift. 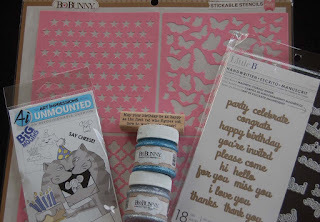 It's fun to make a card and wrap a gift with a theme because all the parts just seem to work together. Thanks for stopping by. 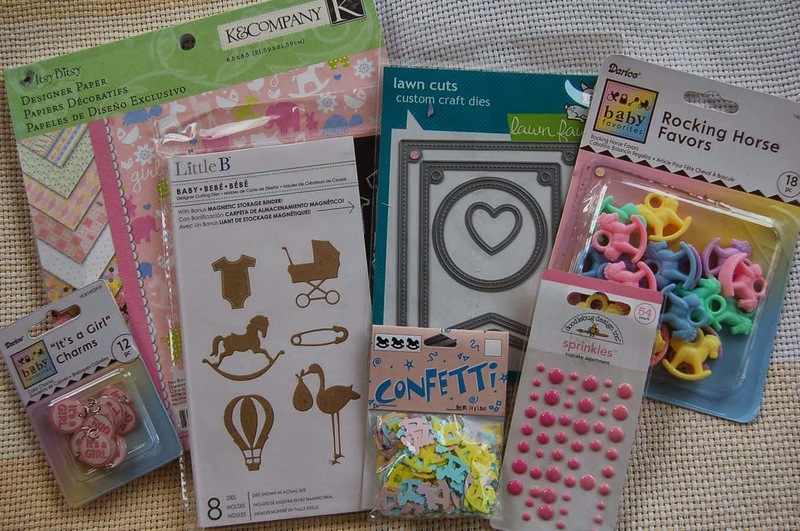 Hope you are having a crafty day!